In May, 2018, President Trump fulfilled a campaign promise and moved the United States embassy in Israel from Tel Aviv to Jerusalem. Since 1995, all U.S. Presidents had promised or spoken about moving the U.S. embassy to Jerusalem. Israelis praised this move and named an Israeli intersection near the embassy Trump Square. Hamas protested this move by staging attacks against the Israeli – Gaza Strip border. Israeli defense forces killed 58 repelling these attacks. Hamas is the radical Islamic terrorist organization that controls the Gaza Strip. Hamas does not recognize Israel’s right to exist as a country and believes Jerusalem needs to be the Islamic capital of Hamas-controlled Palestine. Israel is the only republic on the peninsula of Arabia. The Israeli-Palestinian conflict did not begin centuries ago, but instead, after World War II. In a series of three articles, The Classical Historian traces the Israeli-Palestinian conflict throughout history. Before World War II, there was not an extended history of conflict between Jews and Arabs. In 1947, two years after the end of World War II, the United Nations voted to establish two countries west of the Jordan River; a Jewish and a Palestinian Arab country. The Jews accepted this plan, but the Palestinians and surrounding Arab countries did not. In 1948, Jews in Palestine declared the birth of the modern country of Israel, consisting of the lands the United Nations had set aside. The surrounding Arab nations (Egypt, Jordan, Syria, and Lebanon) militarily occupied the land that had been set aside for the Palestinian Arabs. These four countries attacked Israel. Over the next 29 years, Israelis fought the Arab nations in all-out war, in smaller, disconnected battles, or against Arab terrorist attacks. Major wars during this time were the initial Israeli-Arab War in 1948, the Suez War in 1956, the 1967 Six-Day War, the War of Attrition in 1969-1970, and the 1973 Yom Kippur War. During these wars, Israel defeated the Arabs and conquered land that the United Nations had set aside for an Arab Palestinian country. Israel holds some of this land, believing that it is necessary to repel invasions from the Arab countries. Many Arab countries and people continue to refuse to recognize Israel’s right to exist, and a constant state of war exists. Palestinians organized themselves into various terrorist organizations, aiming to destroy Israel. A terrorist organization attempts to harm its enemy by using horrific acts of barbarity, such as purposefully killing innocent civilians on a bus or in a pizza restaurant, or by assassinating athletes and journalists and women and children. Yasser Arafat founded the terrorist group Fatah in 1959, and in 1970, the PLO (Palestinian Liberation Organization) was established in Jordan and later moved to Lebanon. Hamas, the Muslim Brotherhood, and Al Qaeda are more modern terrorist organizations aimed against Israel. In the last 9 or 10 years, Israel has fought against radical Islamic groups in the West Bank and Gaza, in Lebanon, and has militarily occupied parts of Palestine. Israel has also continued to expand Jewish settlements into areas that Palestinians claim as their own. Hamas, Fatah, and Hezbollah are three terrorist organizations whose stated goal is to destroy Israel. Hamas won elections in the Gaza Strip in 2007 and took over administration. Hamas also defeated the Palestinian Authority. Along with running the government, Hamas built tunnels between Egypt and the Gaza Strip to smuggle in weapons used to attack the Israelis. Over the years, Hamas has launched missiles at Israel. Fatah, another terrorist organization, controls the West Bank. On November 2012, Israel launched a military offensive aimed at destroying the military power of Hamas. Hamas has launched more than 1100 missiles into Israel, and Israel successfully degraded Hamas’ ability to fight. Hezbollah is in southern Lebanon, and periodically launches missiles into Israel or conducts military raids. Since 1995, every U.S. President has spoken about moving the U.S. Embassy to Jerusalem. However, Palestinians in the West Bank and Gaza Strip object to the embassy in Jerusalem because it legitimizes the country of Israel. It is the stated goal of Hamas and Fatah to create a Palestinian country and to destroy Israel. Other Arab nations, and some Asian nations, also desire to annihilate Israel. Hamas and Fatah want Jerusalem to be a capital of an Islamic country. Because manyj have a strong hatred against Israel, each U.S. President has been afraid to move the embassy. The opening of the U.S. embassy in Jerusalem is a sign of American-Israeli friendship and a challenge to terrorist groups and countries who want to destroy Israel. When President Trump campaigned, he declared his administration would move the American embassy from Tel Aviv to Jerusalem. This month, Trump followed through with his pledge. Has Israel acted justly when militarily occupying Palestinian lands of the Gaza Strip and the West Bank? Explain your answer. On May 13, 2018, Americans will honor their moms by bringing them flowers, taking them out to eat, and spending time visiting either by phone or in person. But when did this idea of celebrating mothers begin and how did it come to America? Thousands of years ago, in ancient Greece and Rome, pagans held spring festivals honoring their mother goddesses. Rhea is the Greek mythological mother of the Olympian gods and goddesses and was worshipped as the goddess of fertility and the mountain wilds. In statutes, Rhea is depicted as a matronly woman, seated on a throne flanked by lions. An ancient Rome, Romans celebrated “Magna Mater” (Great Mother), however, these celebrations became so wild and notorious that the Roman government banned Magna Mater’s followers from Rome. What do mothers and wild parties have in common? Ask the ancient Romans. During the first centuries after the crucifixion of Christ, early Christians celebrated Mary as the mother of God, “Theotokos” in Greek and “Mater Dei” in Latin. By the 7th century, Christians around the world set aside January 1st as a special day to honor Mary. In America, Mother’s Day was the brainstorm of Anna Jarvis in 1868. Jarvis wanted to establish a day where Americans would unite for peace and friendship. In 1868, she created a committee to establish “Mother’s Friendship Day,” a day set aside for former Civil War combatants and their families to reunite and form friendships. When Jarvis died, her daughter, also Anne Jarvis, took up the call. Anne Jarvis wanted a day to honor all moms and was upset that America’s holidays were too male dominated. Jarvis sponsored the first U.S. celebration of Mother’s Day at St. Andrew’s Methodist Church in Grafton, West Virginia, in the early 1900s. Anne Jarvis was so successful in promoting the holiday that in 1914, the U.S. Congress passed a law designating the second Sunday in May as Mother’s Day. President Wilson issued a proclamation that on the first Mother’s Day, Americans should show the flag in honor of those mothers whose sons had died in war. Mother’s Day has become a major American and commercial holiday. It is the third largest holiday for sending cards. Americans take their mothers out for brunches or lunch on Mother’s Day, and it has become a source of great wealth for the card and restaurant industries. The founder of Mother’s Day, Anne Jarvis, decried the commercialization of the holiday she championed. In fact, in 1948, Jarvis was arrested for disturbing the peace during a protest against Mother’s Day. The Classical Historian family expresses great admiration and gratitude to all mothers. We see mothers as the teacher of culture, manners, standards, and morality. The author of this article is the 10th of 11 children. He’s glad his mom didn’t stop at number 9. Thanks Mom! 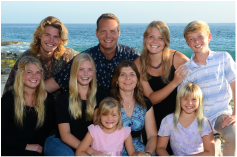 The author’s wife is the mother of seven beautiful children. Thank you, Zdenka! The author’s mother-in-law bravely raised her children as a single mom. Thank you Maminka! And we wish all moms on May 13th, and on every day, a Happy Mother’s Day! In honor of the United States federal holiday of Mother’s Day, all purchases from The Classical Historian are discounted 20% through May 13th, when you use the coupon code Mothersday. ​There is a very close connection between a child and parent. Parents are the people who gave us life, who feed us, who provide us a bed to sleep in, and who teach us how to brush our teeth and say “thank you.” We also look like our parents, speak the same language, and we pray, or don’t pray, as our parents do. In many ways, who we are depends greatly on who our parents are. If someone wanted to determine what kind of a person you would become when you get older, or what type of work you might do, he could study your parents and make some good guesses. In the same way, a country looks very similar to the culture that founded it. The best word to describe this is heritage. Heritage means something inherited from the past. The United States of America started as 13 English colonies, originally founded by Great Britain in the 1600s. Because of this, much of America can be traced to our British heritage. When we look at a person’s past for understanding, we do not stop with studying his or her parents. We also look at grandparents, great-grandparents, and ancestors as far back in time as possible. It is the same when we study America’s heritage. Even though Great Britain founded the 13 English colonies that would become the United States of America, we can trace America’s heritage to thousands of years ago, to cultures and countries much older than Great Britain. Historians divide history into different periods, or times, so that we can understand them better. Ancient history refers to the beginning of the history of man up to the end of the Western Roman Empire (A.D. 476). Medieval history begins with the end of the Roman Empire and continues until about 1500. And modern history refers to the time from about 1500 to today. Our first unit focuses on the ancient heritage of America. Although the United States of America is a modern nation, beginning with the founding of Jamestown in 1607, its heritage can be traced back to ancient times. The United States of America is strongly influenced by the great civilizations of the Ancient Near East and northern Africa. By great, we mean that the civilizations had a large influence on future civilizations. By civilizations, we mean that these peoples had complex agricultural, urban settlements that allowed for inventions and societal developments that made life better. Early, uncivilized peoples are hunters and gatherers who roam over an area (nomads), who do not read and write, and who do not have the technology to build permanent structures. Their lives are short and they do not give much to later nations. Great civilizations, however, are marked by people who develop writing, and who pass on to others inventions or technologies that prolong or improve life. Civilized nations in the ancient world used farming technology that allowed people to have permanent homes and a consistent food supply. The world’s great early civilizations began on the banks of rivers. Ancient people who lived near rivers could fish for food, drink water, travel on boats, and use the water to irrigate their lands. Irrigate means to water fields so crops can grow. Water from large rivers allowed these people to build strong societies. One of the beliefs of nearly all ancient people was that the world was created and ruled by many gods. There was a god for the wind, a god for the ocean, and a god for the rain. People who believe in many gods are called polytheists. Polytheists believe that if you want something, you can make a sacrifice to a god, and this god might then give it to you. If you want it to rain, you might kill an animal and burn it to make the rain god happy. Sadly, some polytheists sacrificed other humans, even children, to their gods. Polytheists did not believe that there was a clear right and wrong. Since there were many gods, and sometimes the gods competed with each other, what was right often depended on what the ruler said was right. In Egypt, in ancient Africa, the leader was called pharaoh, and all Egyptians had to consider pharaoh a god. For the pharaoh, right was whatever made him strong. This meant that if the pharaoh believed killing someone made him strong, then killing was right. One people of ancient times, the Hebrews, believed in one God. This idea is known as monotheism. The Hebrews believed that their God created a moral system built on what was right and what was wrong. Hebrews believed that God gave them their moral system as well as their system of laws. It is from the Hebrews that Western man received these foundations. America’s laws are founded on Mosaic Law, which includes the well-known Ten Commandments. Much of America’s culture, language, laws, government, philosophy, and performing arts comes from ancient Greece and Rome. Classical Greece and Rome established democracy and representative democracy, cultural norms, and artistic practices that are exhibited in the United States of America today. The American Founding Fathers thought so highly of ancient Greece and Rome that they used the architectural styles of the Classical world, known as Neoclassicism, for the most important buildings in Washington, D.C. To appreciate American history, it is necessary to understand ancient Greece and Rome. Within the Roman Empire, a Hebrew carpenter and his wife had a boy named Jesus who founded the first universal belief, the first religion open to all people in the world, and brought the idea of equality before God to all. This belief would have a direct role in the establishment of the United States of America. Jesus Christ taught that God loved all people in an equal manner and that salvation was open to all, regardless of one’s tribe or nation. About one thousand, seven hundred and seventy-six years after the birth of Christ, Thomas Jefferson wrote in America’s founding document, the Declaration of Independence, “…all men are created equal, that they are endowed by their Creator with certain unalienable Rights, that among these are Life, Liberty and the pursuit of Happiness.” Jefferson linked the ancient religious beliefs of Christianity to the founding of the world’s first modern republic. This heritage from ancient times shaped the United States of America that we know today. Abraham Lincoln was the most hated and despised president of all time, yet he is one of America’s greatest presidents. During the years before the presidential election of 1860, Lincoln clearly stated that slavery was a morally evil and corrupt institution, and that one day, the country would be either all free or all slave. His clarity on this issue led the South to believe that Lincoln would try to abolish slavery, even though he never stated he would. His election to the presidency in 1860 pushed the first Southern states to secede and form the Confederate States of America. Over the next four years, 1861-1865, Lincoln led the effort to crush the rebellion in the South. Lincoln’s circumstances of youth were common to many Americans. He was born on February 12, 1809, in Kentucky, in a log cabin. His family was part of the Separate Baptist Church, which forbade alcohol, dancing, and slavery. Abraham’s dad, Thomas, saw Indians kill his own father. When Abraham was 9, his family moved north to Indiana. Then, Abraham’s mom died. About a year later, Thomas remarried to Sarah, called “Sally.” Abraham came to love Sally and called her “mother.” As a young person, Abraham learned to read and write at an “ABC School” a few weeks per year. In ABC Schools, children in a larger community met at a log cabin and were taught by a private tutor. Lincoln read the Bible, Robinson Crusoe, Decline and Fall of the Roman Empire, Franklin’s Autobiography, and law books, whenever he had extra time. At the age of 21, Lincoln moved west to Illinois. As a boy and young man, Lincoln was known as physically strong and a person of wit. He was 6 feet, 4 inches tall, lanky and wiry. For fun, he would tell stories and wrestle. Lincoln is enshrined in the Wrestling Hall of Fame, and had a 300-1 record. Once, after beating his opponent, Lincoln looked at the crowd and declared, “I’m the big buck of this lick. If any of you want to try it, come on and whet your horns.” Nobody took him up on the offer. Lincoln was a reader, a hard worker, and a person of character whom others respected. He read the few books he had many times, and when possible, he borrowed books from other frontier settlers. While living with his parents, he worked on the family farm all day. Lincoln traveled by flatboat down the Mississippi River in 1828 and 1831, and he later received a patent pertaining to flatboats. In the Black Hawk War, Lincoln was voted militia corporal. When he lived on his own, Lincoln opened a store with his partner, who then embezzled all the money. Lincoln worked to pay off the resulting debt of $1,000 (equal to about $26,000 in 2017). Later he decided to be a lawyer. "When I left Springfield I asked the people to pray for me. I was not a Christian. When I buried my son, the severest trial of my life, I was not a Christian. But when I went to Gettysburg and saw the graves of thousands of our soldiers, I then and there consecrated myself to Christ. Yes, I love Jesus." Abraham Lincoln married Mary Todd in 1842 and had four boys. Though Lincoln left Mary Todd at the altar during their first wedding attempt, Lincoln called marriage a “profound wonder.” His son Edward died at the age of four of thyroid cancer. William died at the age of 12 of typhoid fever. Tad died of pneumonia at the age of 18. Only Robert lived into adulthood, dying in 1926. The boys’ deaths were a source of great sadness for the Lincolns. In 1858, Americans learned a great deal about the thoughts of Abraham Lincoln through the Lincoln-Douglas Debates. Republican Abraham Lincoln was running for an Illinois U.S. Senate seat against the incumbent Democratic Senator Stephen Douglas. Lincoln was relatively unknown in the country, and many believed Douglas would one day be president. Lincoln and Douglas debated seven times, with each debate lasting around three hours. The debates were big events, with bands, food, and whiskey. At the end of each debate, the candidates shook hands, and maintained a cordial, friendly attitude toward each other. There was no questioner or moderator, only the two men on stage, speaking at great length. At the Lincoln-Douglas Debates, the two candidates expressed greatly different views, especially on slavery. Lincoln spoke strongly against slavery, calling it a moral evil. Lincoln’s clear and unequivocal talk on slavery angered Southern Democrats who wanted slavery to expand. Douglas stated that he was personally against slavery, but he favored popular sovereignty, that the decision should be left to the people in the individual states. In the Lincoln-Douglas Debates, Lincoln argued that the new Republican Party believed the Southern states opposed the ideals found in the Declaration of Independence. Lincoln saw slavery as a sin, as evil, and as a threat to liberty and equality for all. How Lincoln foresaw ending slavery, however, was through legal means, either by voting or appointing Northern judges who would chip away at slavery in the courts. He wanted to peacefully abolish slavery through law, over time. Stephen Douglas won the 1858 Senate election against Abraham Lincoln, but Lincoln became a national political figure. All Americans understood that Lincoln and the Republicans saw slavery as morally corrupt, and that over time, they would work to end it. When Lincoln was elected president in 1860, the Southern states believed they had to secede from the Union in order to preserve the Southern culture, which included slavery. Nearly the entire Presidency of Abraham Lincoln consisted of the Civil War. Over 600,000 Americans gave their lives, and over that number suffered injuries. The North defeated the South and the United States remained as one country. Immediately after the war, the northern states passed the 13th Amendment, which abolished slavery. Five days after Lee’s surrender and just over one month after Lincoln’s second inauguration, a Southern actor conspired with others and then shot Abraham Lincoln on Good Friday, April 14, 1865. Lincoln was attending a play at Ford’s Theatre in Washington, D.C., when his bodyguard John Parker left his post to get a drink at a nearby tavern. John Wilkes Booth snuck behind the president, aimed his .44–caliber gun inches from the back of Lincoln’s head, and fired. President Lincoln was carried across the street to a nearby inn and died nine hours later. After the assassination, Booth jumped to the stage below, shouted, “Sic semper tyrannis” (“Thus be it ever to tyrants”), and escaped on his waiting horse. Soon after, Federal soldiers trapped him in a barn, set it on fire, and a cavalryman shot Booth as he tried to escape. Lincoln’s conspirators had planned to murder a number of Republicans, but failed in their attempts. Four of Booth’s conspirators, three men and one woman, were hanged. Three others received life sentences, and one went to jail for six years. Lincoln’s assassination immortalized the 16th President, alongside Washington and Jefferson, as one of America’s greatest heroes, and it led Congress to punish the South for its rebellion. The morning after Lincoln’s murder, Walt Whitman wrote the poem “O Captain, My Captain.” This poem expressed the grief many people in the North felt after Lincoln’s death. With malice toward none; with charity for all; with firmness in the right, as God gives us to see the right, let us strive on to finish the work we are in; to bind up the nation’s wounds; to care for him who shall have borne the battle, and for his widow, and his orphan—to do all which may achieve and cherish a just and lasting peace among ourselves, and with all nations. Lincoln had planned generous peace terms for Southerners who had joined the Confederate States of America, but his assassination gave control of the government to the Radical Republicans, who wanted to completely change the South. For a more detailed version of Abraham Lincoln, slavery in America, and the Civil War, read The Story of Liberty, America's Heritage Through the Civil War, by John De Gree. For a Video Lesson on Lincoln, Go Here and scroll down.